I entered a G/T class in fourth grade and quickly understood what it meant to be a nerd. Unfortunately, I was one. I bucked that image as soon as I started junior high and didn’t look back. Today, however, my teenage daughter would definitely call me a nerd and I embrace that label. I get excited about perfect-looking avocados when I cut them open, fun new Chrome extensions, and writing blog posts on airplanes. I can sit and talk with someone about teaching, leadership, educational technology, writing or books for as long as we have time (if they are interesting, that is). I get excited when that person has a similar passion for life and wants to share it with me. I was practically bouncing up and down when a friend asked me to explain the Chromebooks that her children will be getting through school next year. I may get a bit emblazoned when discussing some local leadership practices that go directly against what is best for students and teachers. Do those things make me a nerd? I make up silly songs to make my son laugh. I use words like “rad” to make my daughter roll her eyes. I take pictures of perfectly-ripened avocados. I read picture books to kids using silly voices because it’s more fun for me. I love to play board games. And card games (especially Euchre and Cribbage). I wear a helmet when I ride my bike. I have living room dance parties to hip hop from the 90s. I say things like, “Look at the sky. Isn’t it beautiful today?” to my kids who are so wonderful that they always look and agree. Disparaging labels are flung too freely these days – often we are the ones using them about ourselves. And while I’ll still jokingly call myself a nerd when the occasion calls for it (because I own that, people), I need to also embrace my awesomeness. If not for myself, then to be a good model for my children who are always watching and listening. But really, for myself, too. 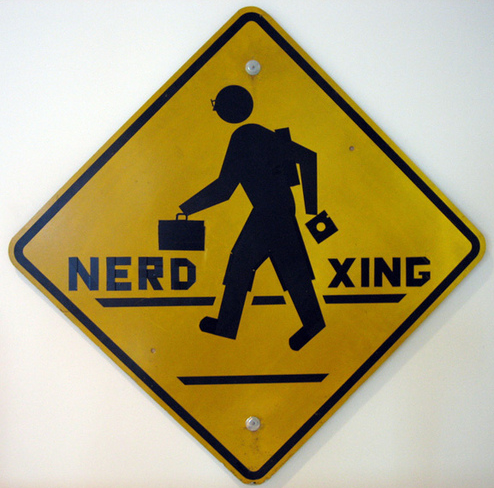 1 Response to What does it mean to be a nerd? I loved this and could relate to so many things, especially the trig. (Ugh) and telling my kids how beautiful the sky looks. Great Nerds think alike and I embrace that!